And don’t you dare even try to convince me that you are not soliciting, but merely making me aware of the most important thing I will ever need to know/buy/donate to. It happened a few months ago. It was a nice day, so my windows were open, but I had a migraine and I had it bad! It was on the couch in as little clothing as is socially acceptable with a cold pack on my head and a fan directed straight at me with my legs up over the arm of the couch. Some [heretofore bitterly resented] solicitor looking for donations for a fairly [good cause, actually] knocked, then rang the bell, then knocked/pounded again…and again! I tried to just ignore my dog barking like a banchee and hoped the nincompoop would leave and let me get back to tending my head pain. He walked over, looked in my open window (cupping his hands!) and said, “Hey-are you going to come to the door?” Grrr@#&^%$(*^!!!rrrrrrr. That was it. Enough. He had now marred the good name of a good cause and made me want to smack him. I may or may not have threatened to call the police if he did not get off my porch. Sorry, everybody else: No more steaks out of the back of a truck or fake perfume that “smells just like the real fragrance” but is 1/116 the cost. ENOUGH! Do not try to sell me a new roof or milk or magazine subscriptions or cleaning products I “can’t get in the store” or religious brochures or doo-dads of any kind. Do not knock or ring my bell or stand on my porch and you sure-as-shooting better not look in my windows. 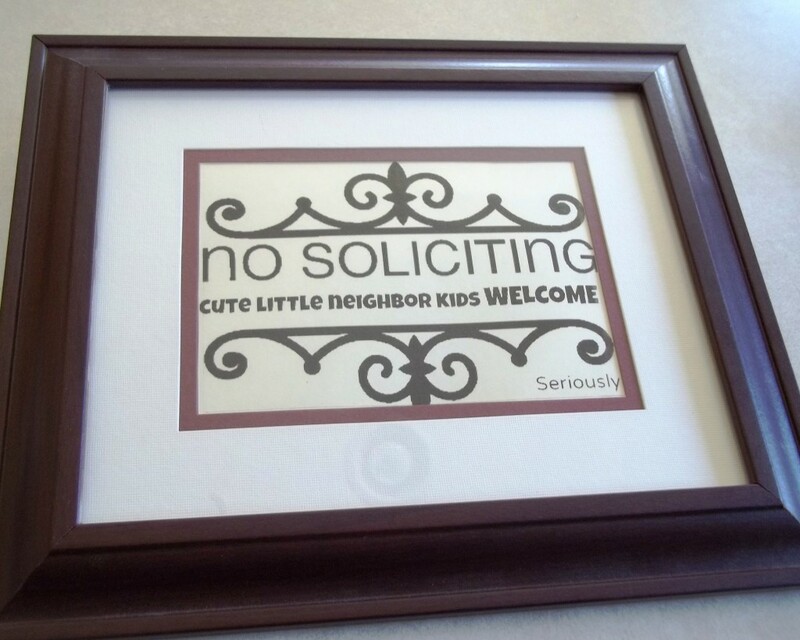 HOWEVER – if you are one of my sweet little neighbor kids with cookies or candy or $27 wrapping paper, come on in. YOU are welcome! Not unfriendly, just oh-so-smart and witty…love it!! I think it’s great.. Can I put one on order? What in the world?!??!!? That is CRAZY and you are FAR nicer than I would’ve been. WOW. Love the sign.